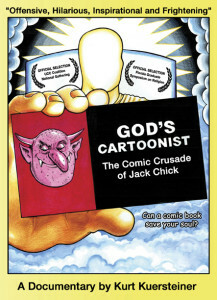 You either love or hate ‘Chick Tracts’ – this documentary is interesting. Imagine this – over 1 Billion of these have been printed, in over 100 languages. Jack Chick may be the most successful cartoonist, in numbers of items sold, ever. And yet, he is not that well known. There’s a 2008 documentary made about him (Amazon). Here’s the (not so great) trailer.